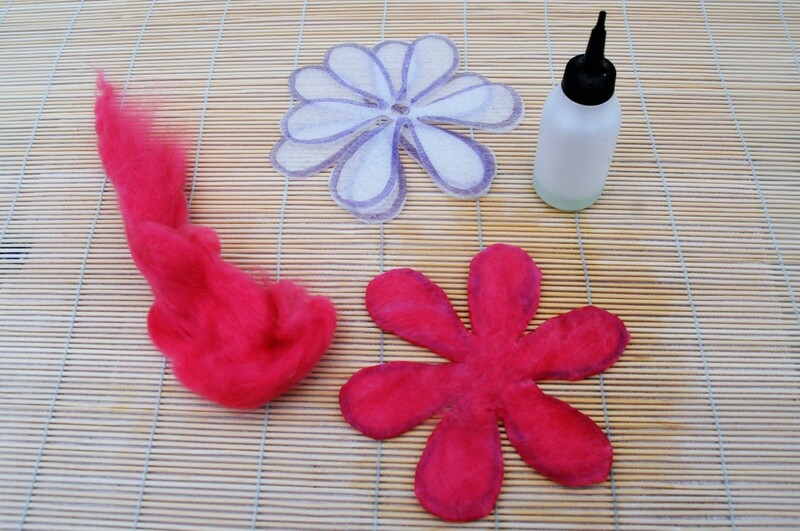 In this tutorial, you will learn a new method for creating a 3D wet-felted flower. 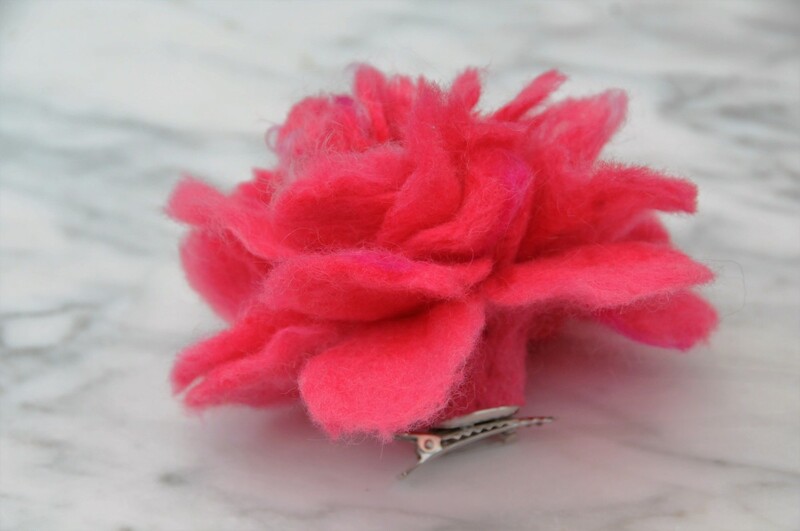 At the top of the article, you will see several different templates that you can be used to create the flowers as well as a brooch or hat pin. Olive oil soap grated and diluted in hot water. 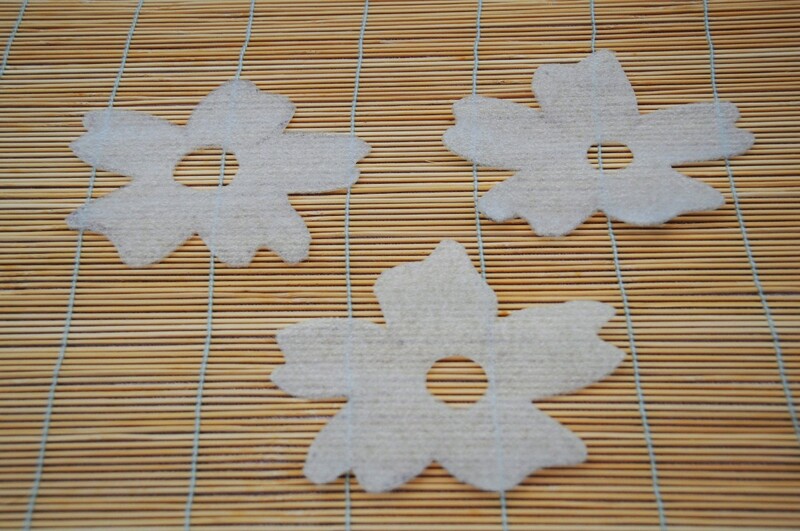 You should use laminate floor underlay to make the templates for these flowers. 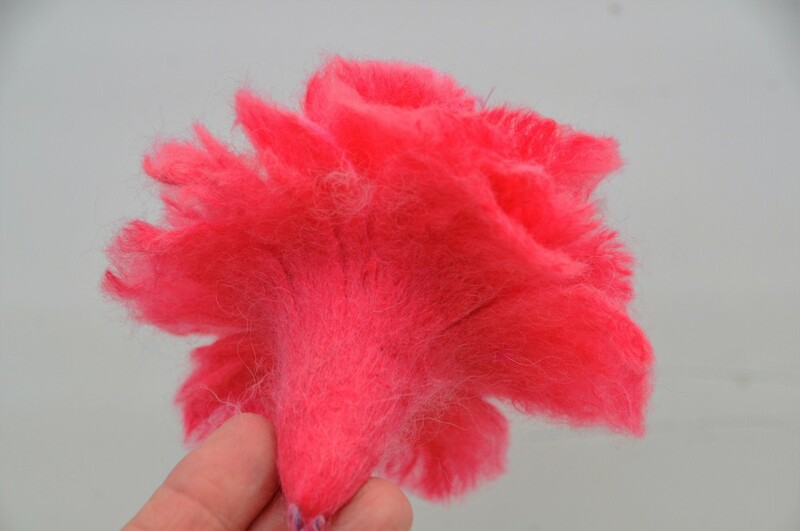 Not only is it cost effective but it can be used for a multitude of other wet felting projects including hats and bags. The thickness and texture of the underlay are perfect for this project. This is because it is neither too thick or too thin and with careful handling, the templates can be used over and over again. Zoom into one or more of the images shown above using your own computer screen. 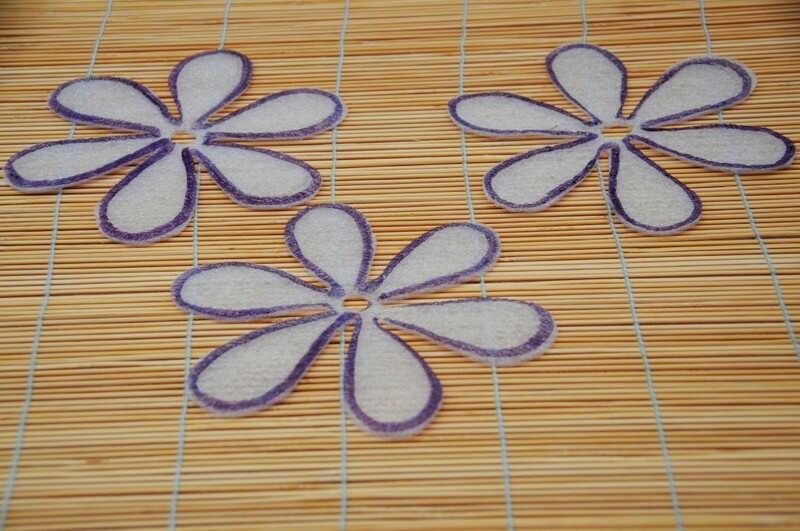 Cover each magnified flower with a sheet of A4 computer paper and use a soft felt pen trace to trace one or more of the images from the screen. 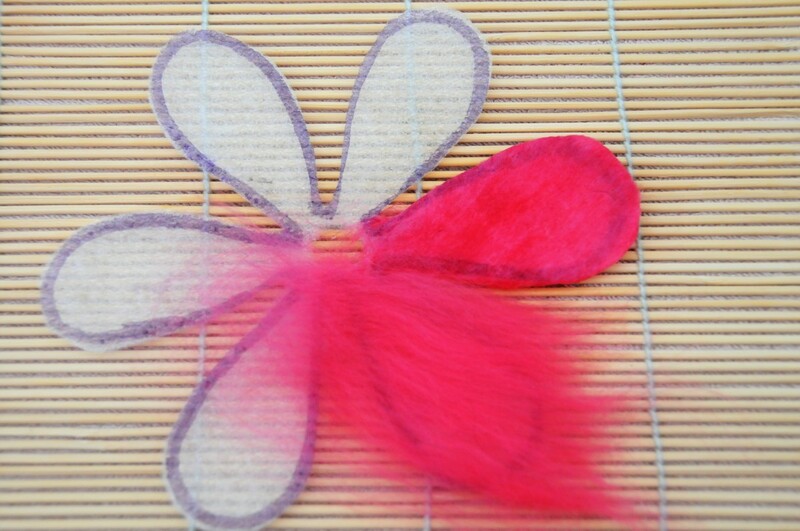 Cut out the paper image. 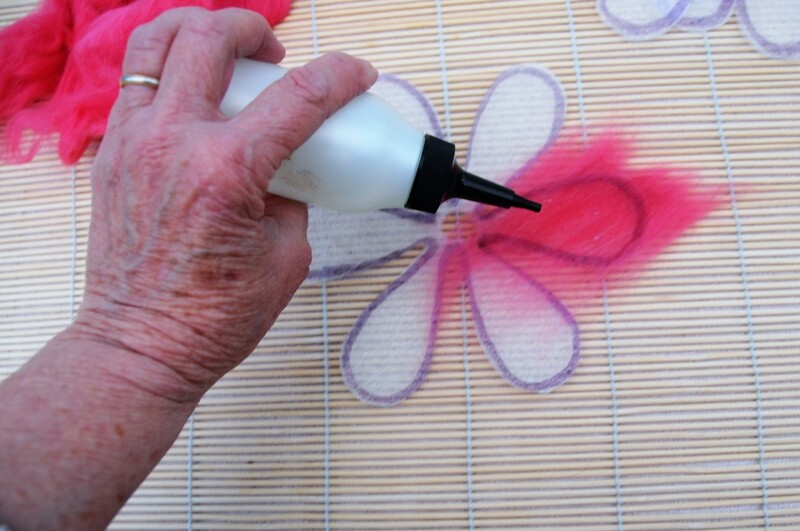 Put the drawing underneath a sheet of floor laminate underlay and trace around the flower using a felt tip pen. 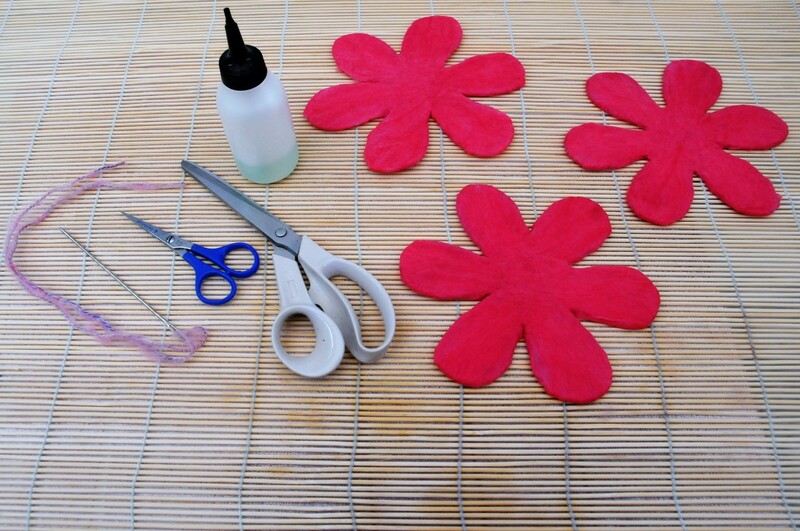 Cut around the edges of each template and remember to cut a hole in the centre of each template. 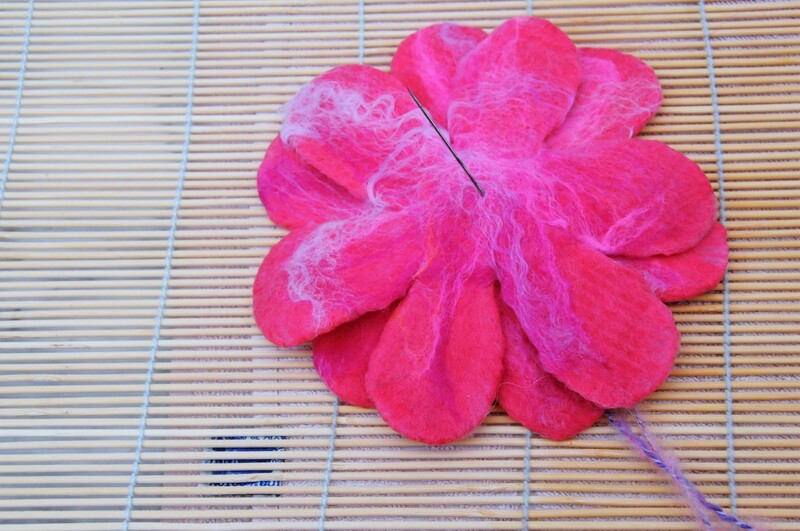 Cover side 1 of each petal with a fine layer of merino wool roving. 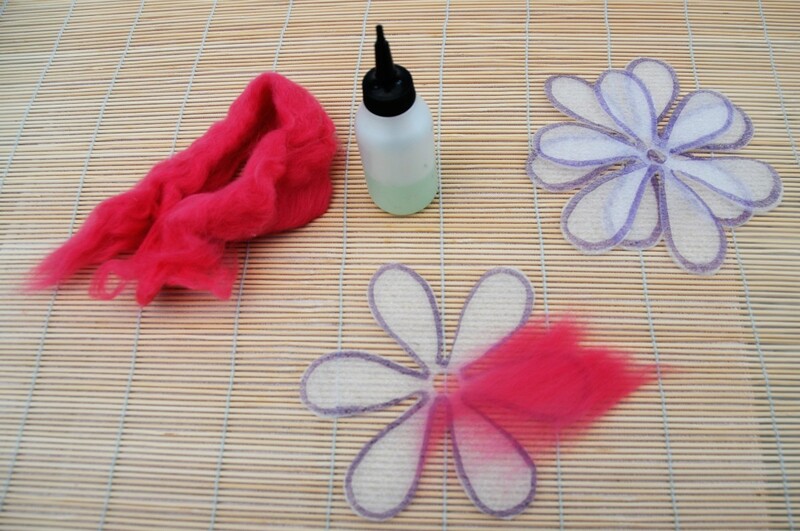 Use the petal with diluted soapy water and use the squeeze bottle to dampen down the 1st petal. 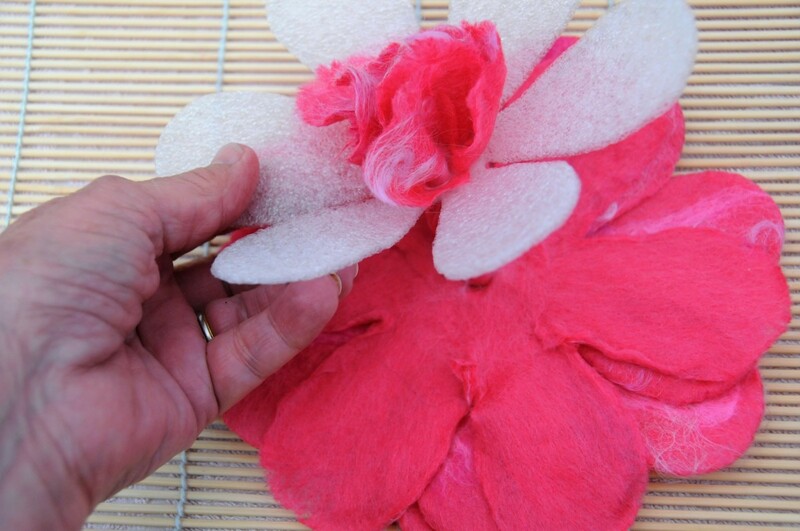 Add more fibre to the rest of the petals and fold any loose fibres over to the other side. 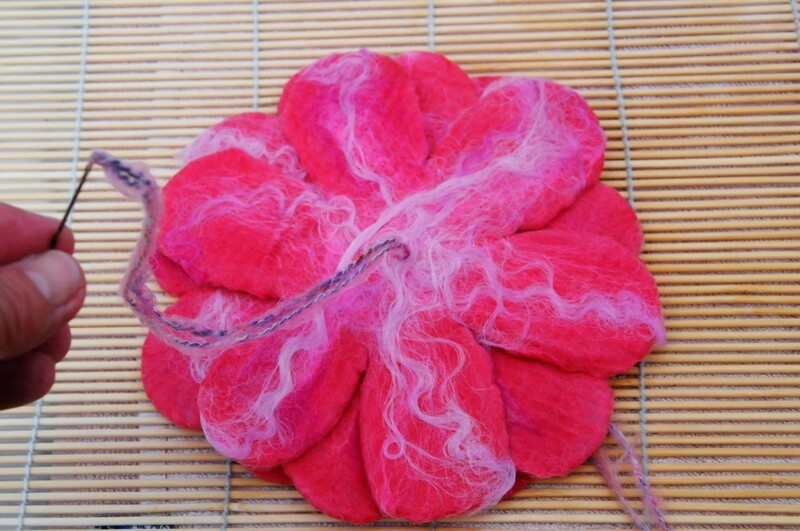 Cover the other side of each template using another fine layer of merino wool roving. 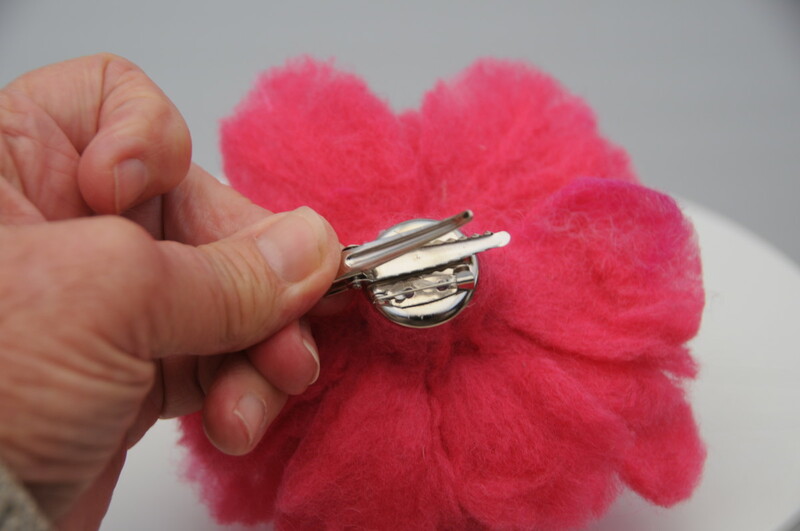 Wet and neaten the edges as before. 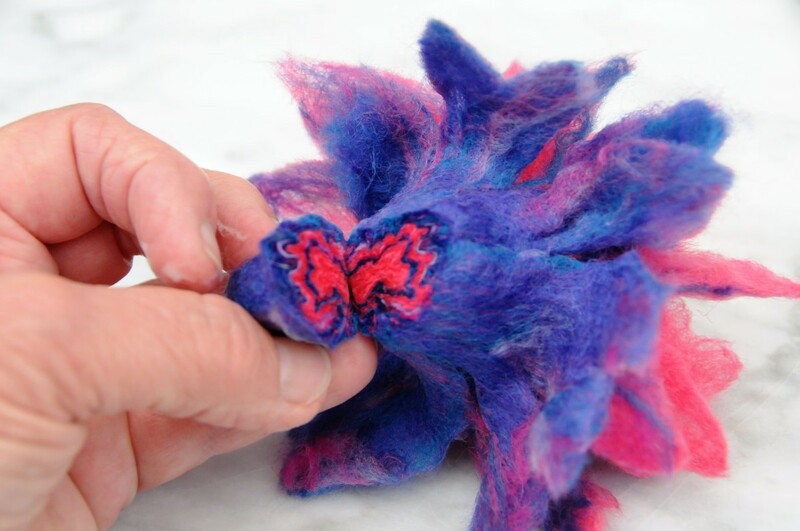 Complete the layers by finishing off the edges and damp down the wool with hot soapy water. Keep on rotating the layers inside as you roll. 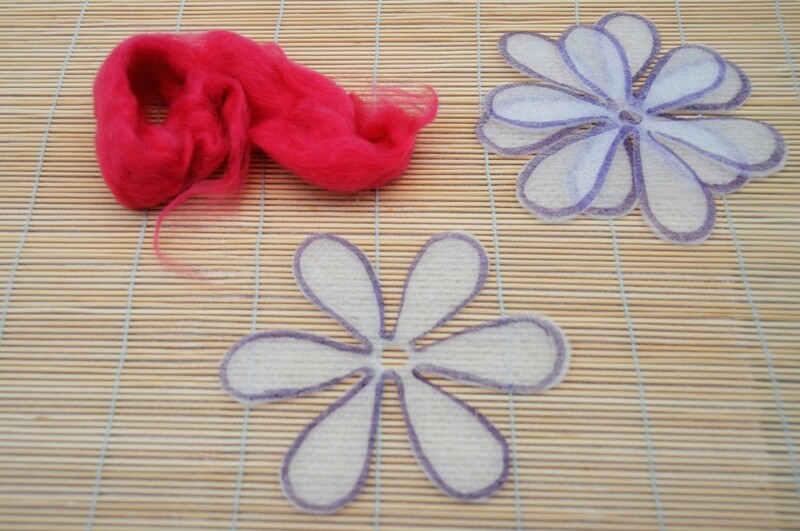 Rotation of the templates inside allows the fibres to shrink back evenly. 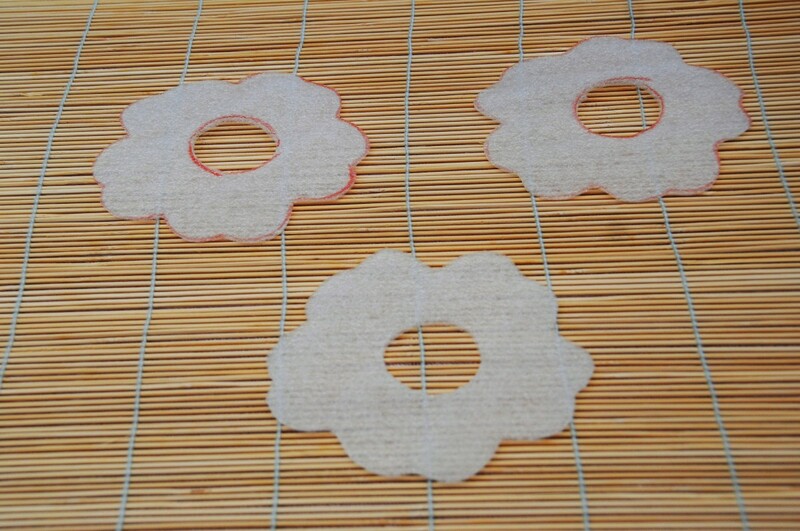 Roll until the templates until they start to curl a little. 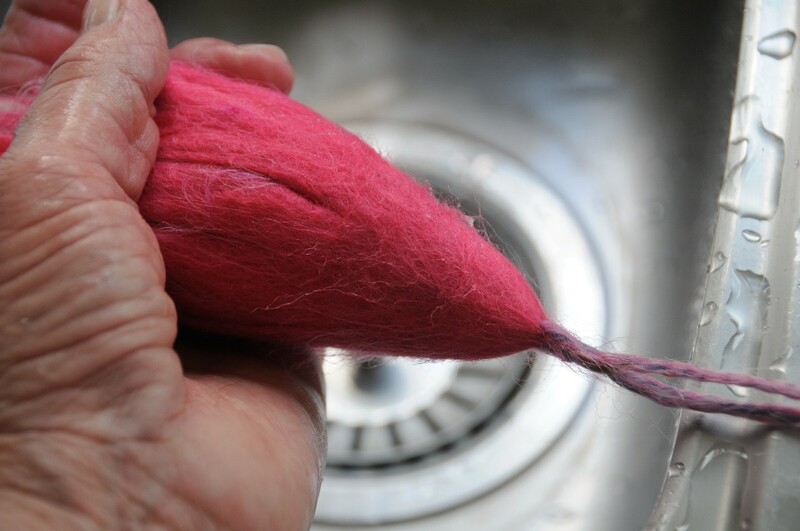 Do a pinch test to make sure that there is no longer any movement from the fibres. 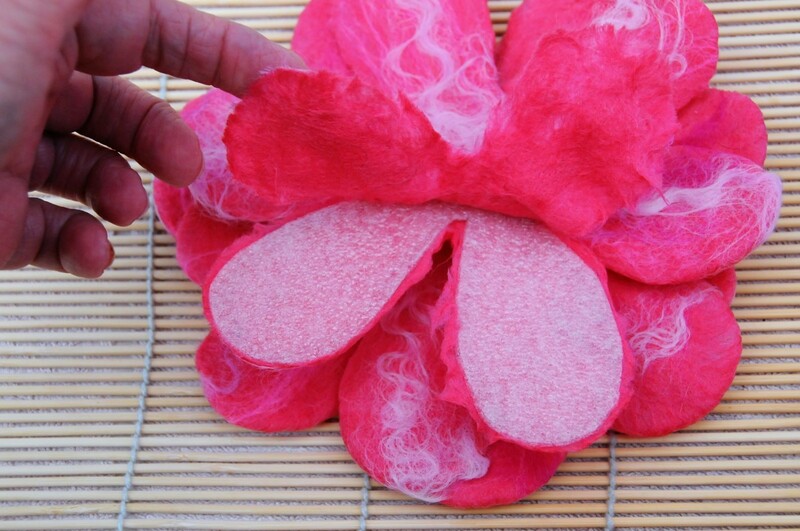 Stack the Petals and Sew right through the 3 layers to the other side. 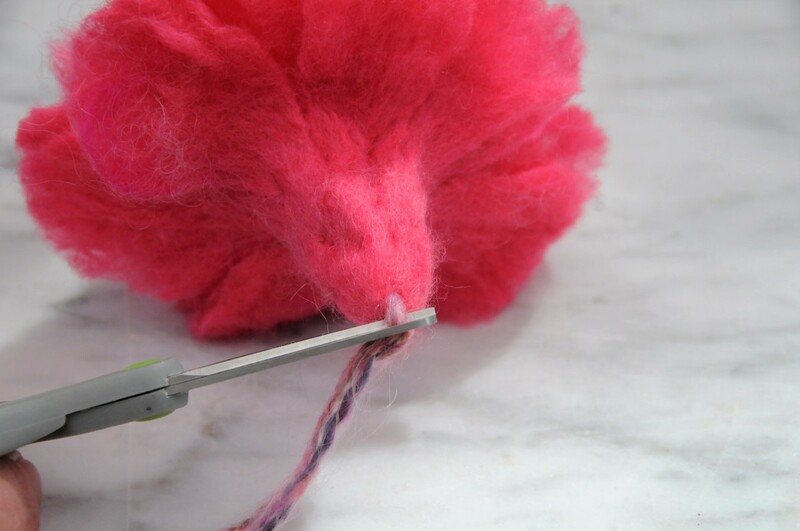 Return back through the layers using the needle and thread and make two knots in the knitting yarn to secure the 3 layers together. 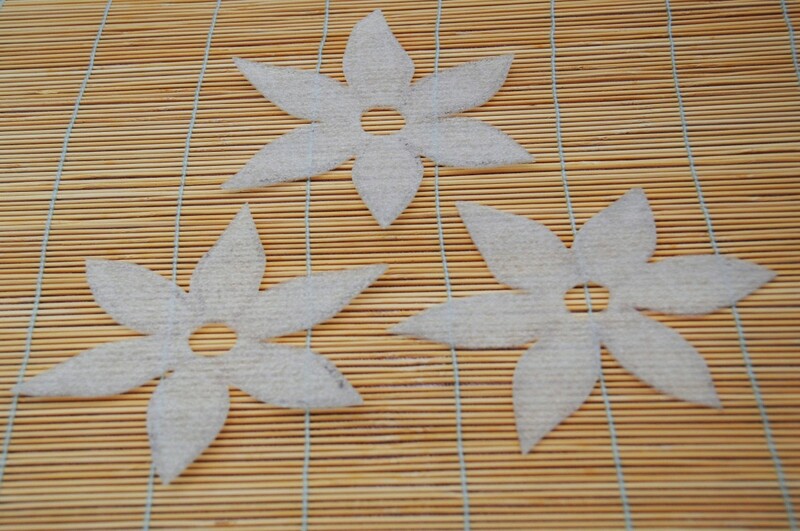 Use a small pair of sharp scissors to cut through the layers to expose the template inside. 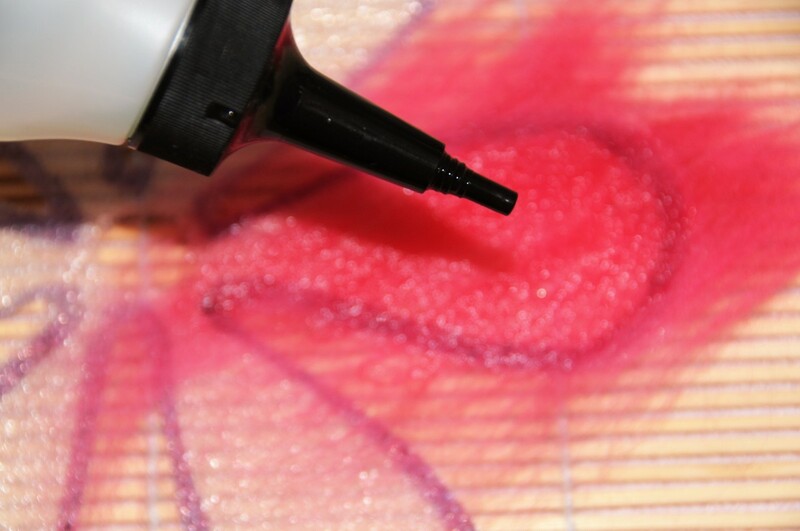 Cut right on the edge of the template for a neat edge. 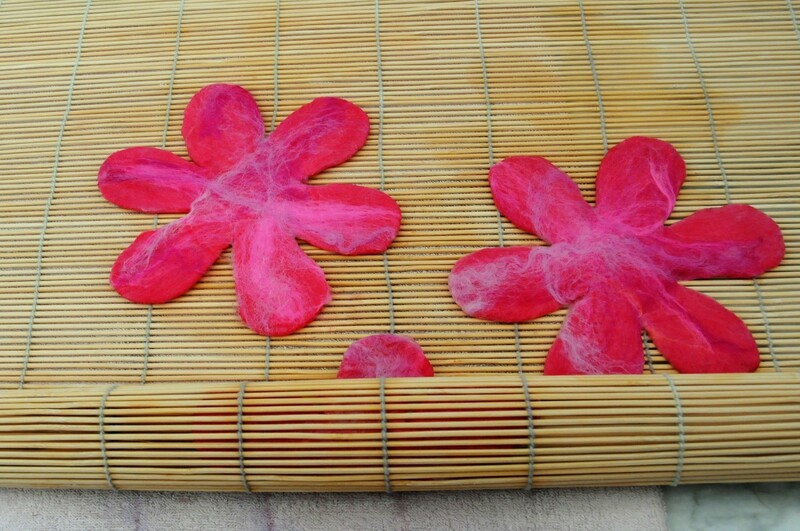 Pull the petals gently through the hole in the middle of the template and remove the template. 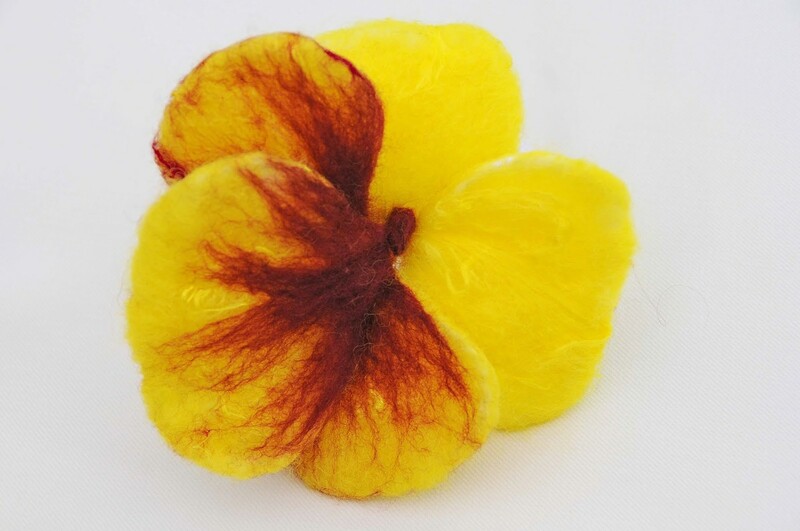 The Petals will still be fragile at this stage so handle them with care. 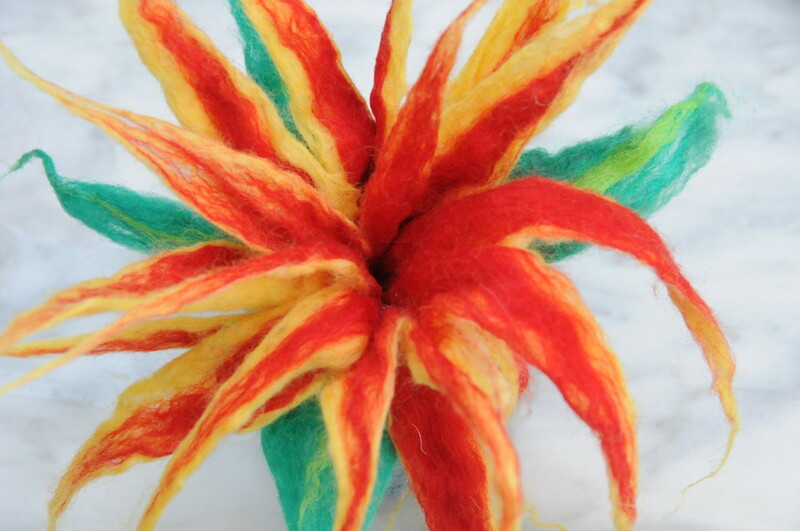 Hold the flower upside down using the wool strands as shown. 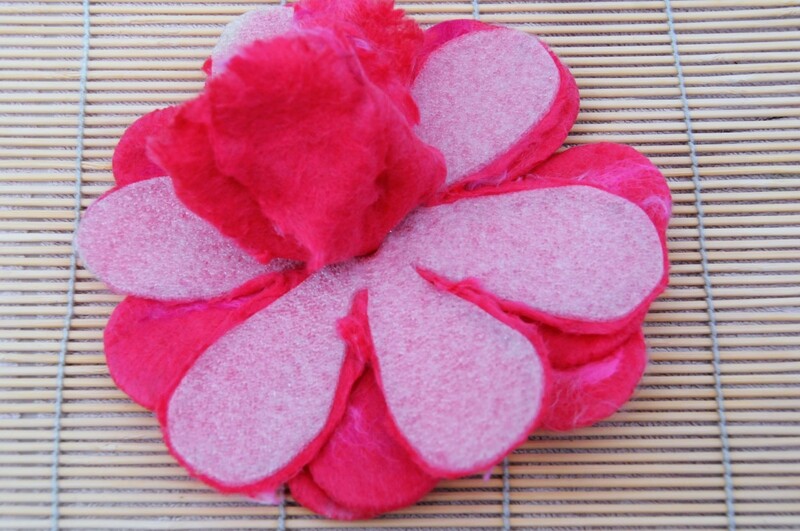 Gently cup the flower petals in your hand and gently squeeze any excess water out. 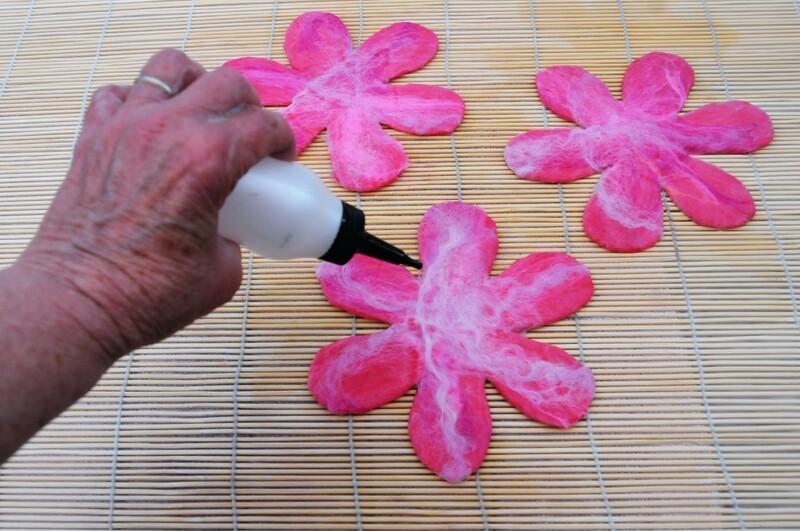 Add a little soapy water to the base of the flower and hold the flower firmly. 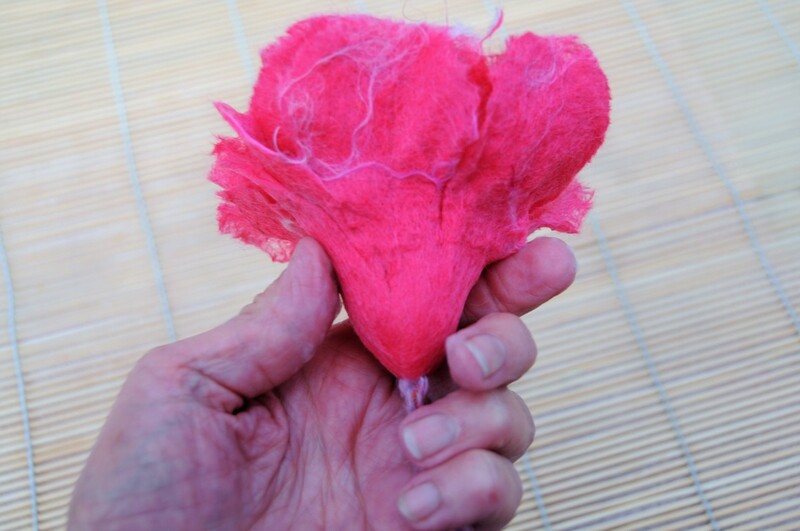 Slide your fingers up and down the base of the flower and rub well until you start to feel the fibres shrink beneath your fingers. 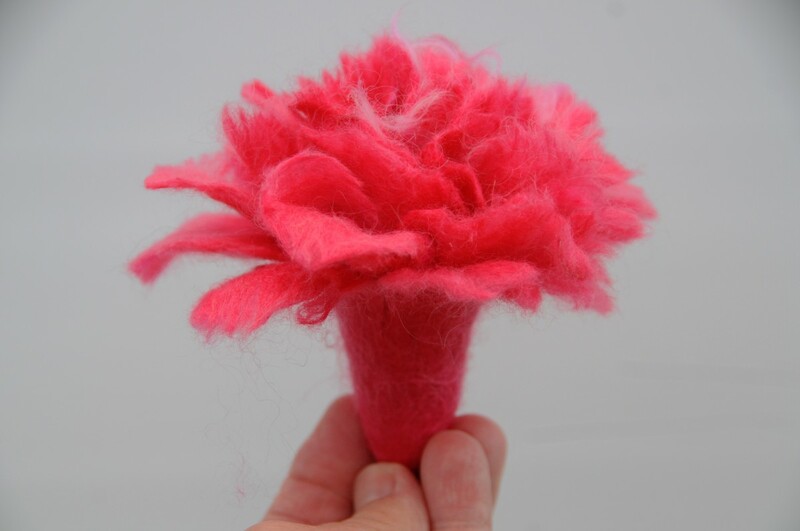 The stem will narrow as it felts down. 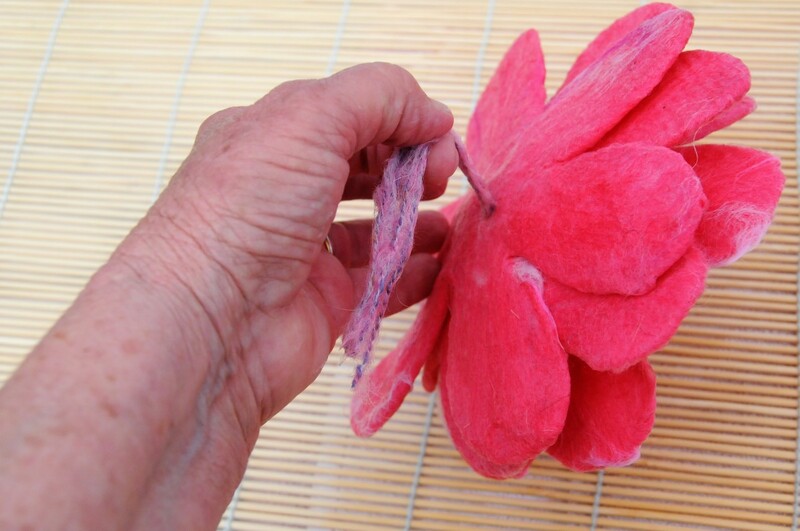 This may take a little while but by doing so you will be felting the lower half of the flower together to create a firm base for the flower. The classes continue, taught by a master craftsperson. :) I'll be sharing this on Twitter. Thank you Sally! I love the vase too. 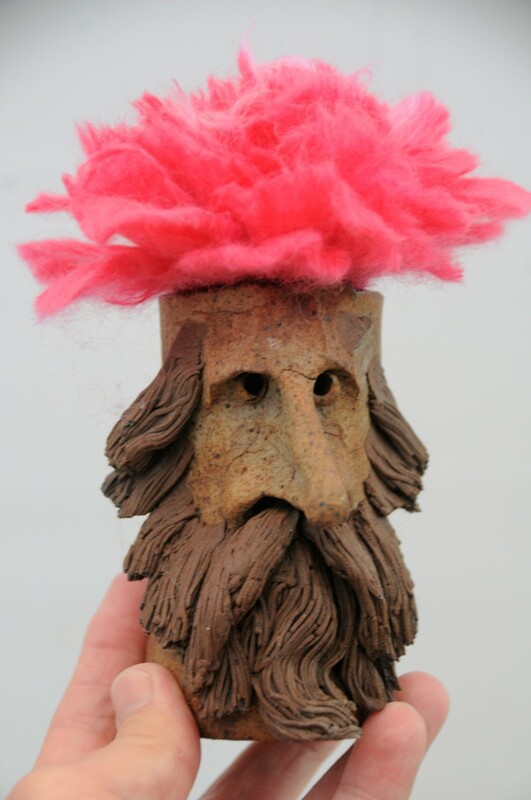 I always wondered where and who made it because it is clay moulded onto what must have been a blue bottle before it was fired. I think it has the mark of the person who made it but was never able to find out who it was. The flowers look beautiful, Sally. (I love the vase, too!) 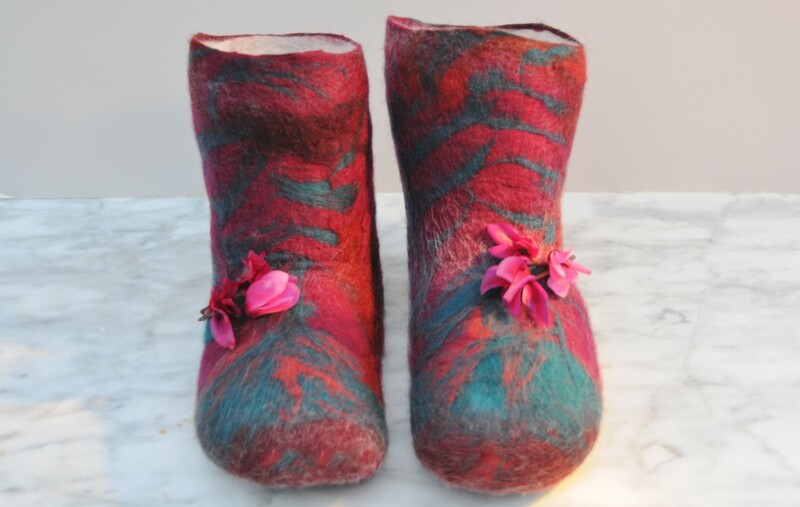 Your wet felting projects are always interesting. 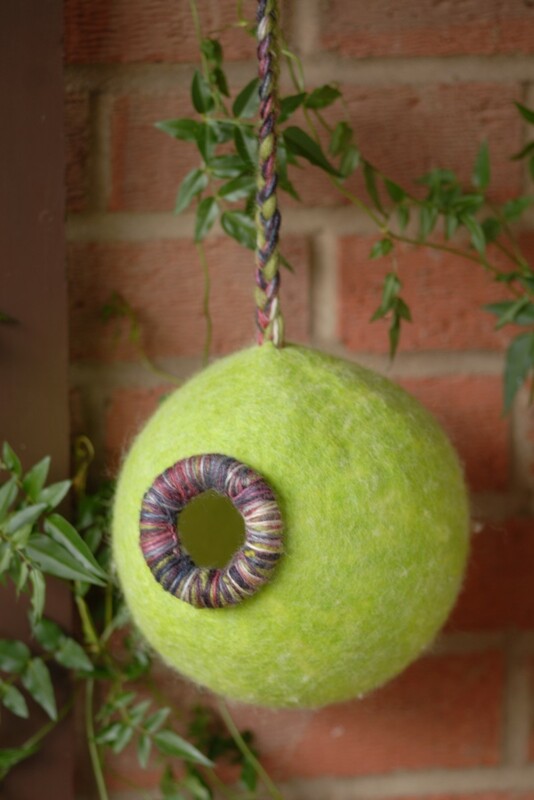 Sally, you amaze me with your lovely products and easy to follow tutorials. 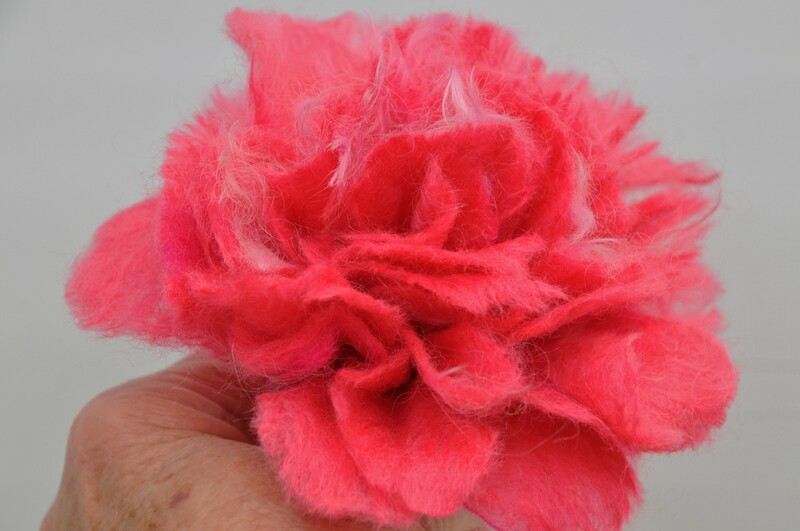 I haven't gotten into felting yet, but I am a crafter and may someday. I rated this tutorial as "moderate", and then I noticed that everyone else did, too, so I guess I wasn't far off. Thank you so much MsDora! Your support is valued and appreciated. Another beautiful work of art! I am so impressed by your creativity. 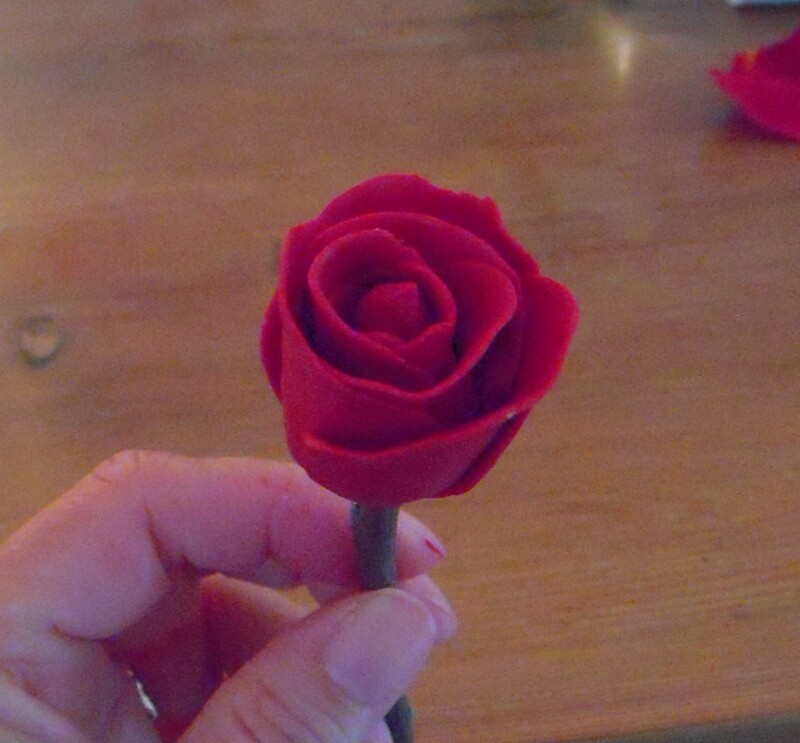 No, the flower will not droop. 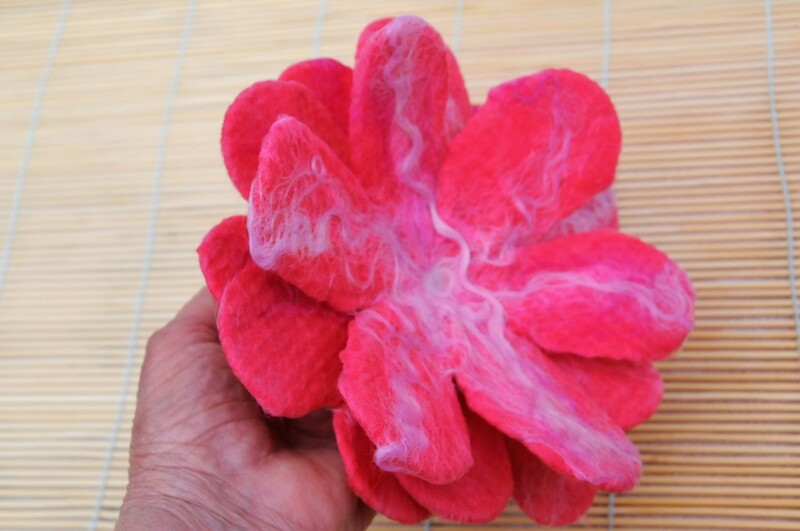 If you want to refresh or wash the flower you can simply dip it in hot and then cold water and reshape it. 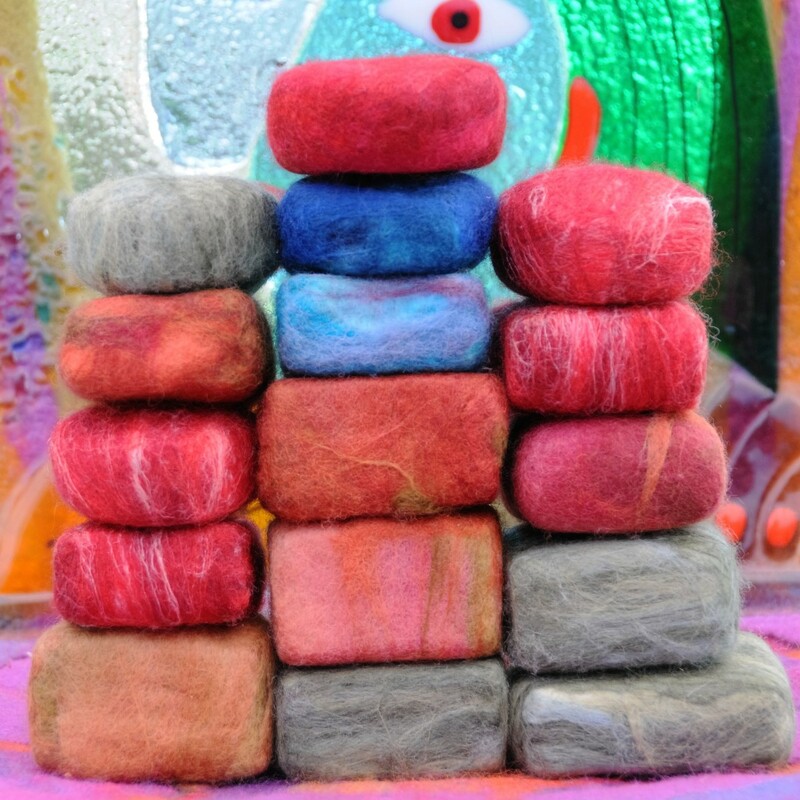 Felt must be one of the most forgiving textiles there is. 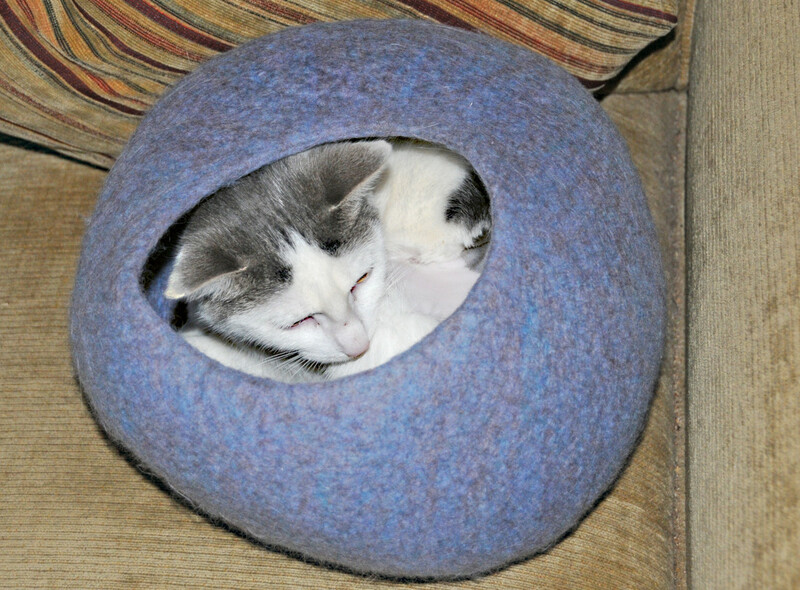 I have on countless occasions made a new item from old, it is astonishing. Olive Oil soap can be bought in bars just like normal soap from the chemist. 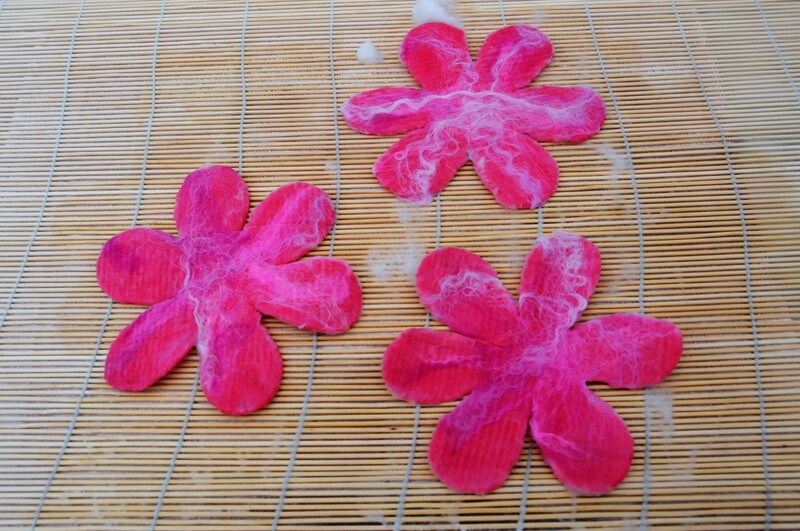 grated and diluted with water. 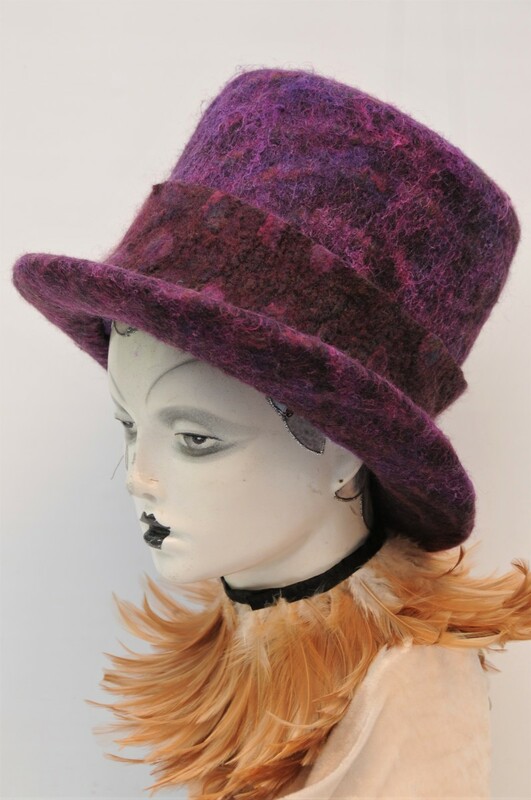 To be honest, if I see some at a car boot or thrift shop I buy it for future projects. E-Bay and Amazon will have it too. If all fails, dish washing soap works just as well though is a little harder on the skin. I appreciate your stopping by to comment, thank you. I am always amazed at the end result. Just a few questions. 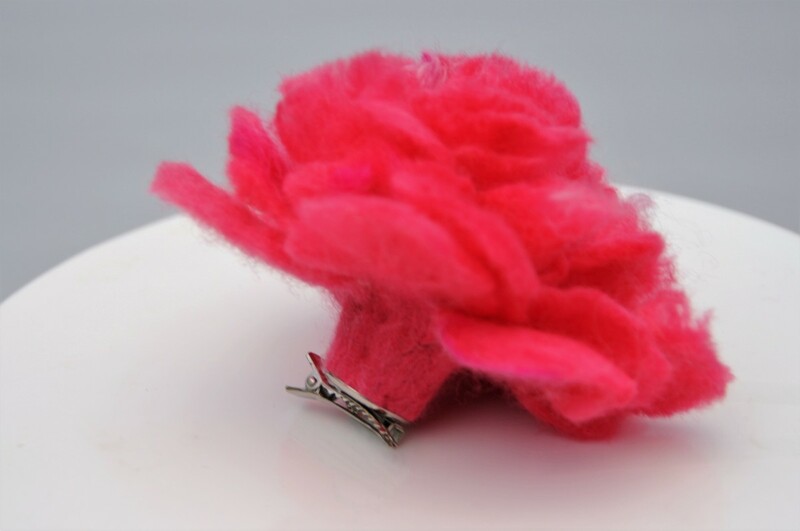 After a time, does the flower begin to droop if it is being worn as a brooch? 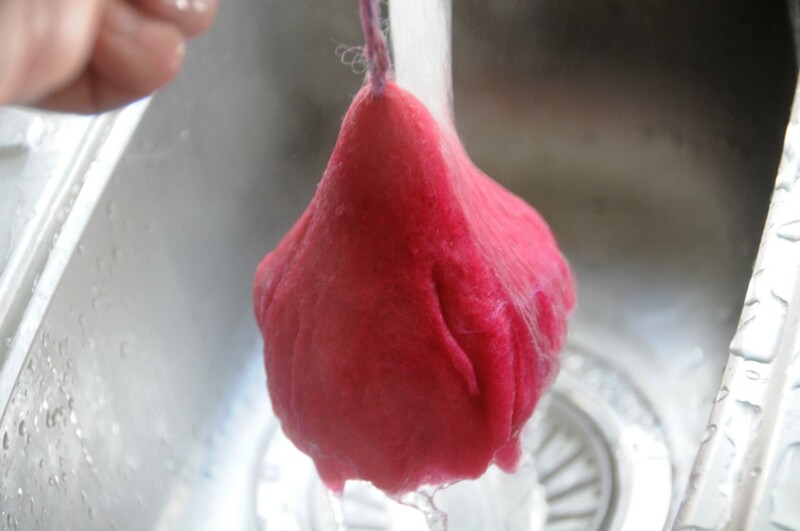 Is there something that needs to be sprayed on it, like starch to keep it firm. 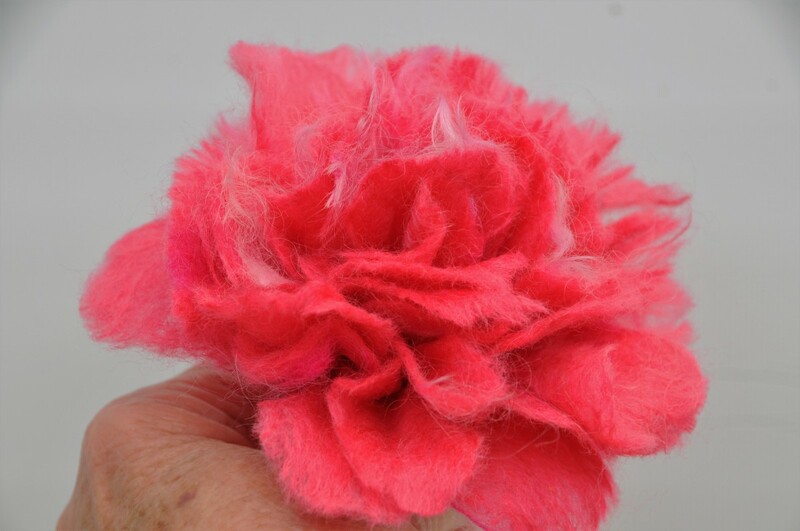 I imagine you don't want to kill the soft fluffy look. Also, I have never heard of olive oil soap, is that found online and craft stores? 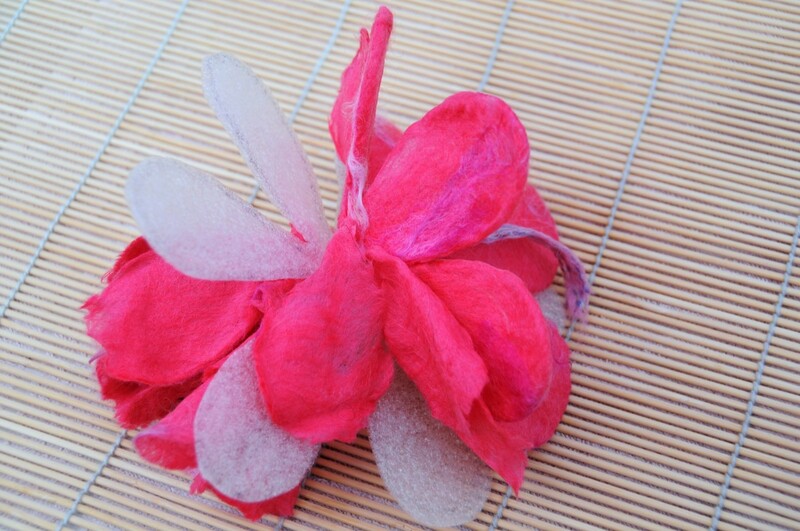 You are so creative with your designs. Yes, it is interesting how different they look. 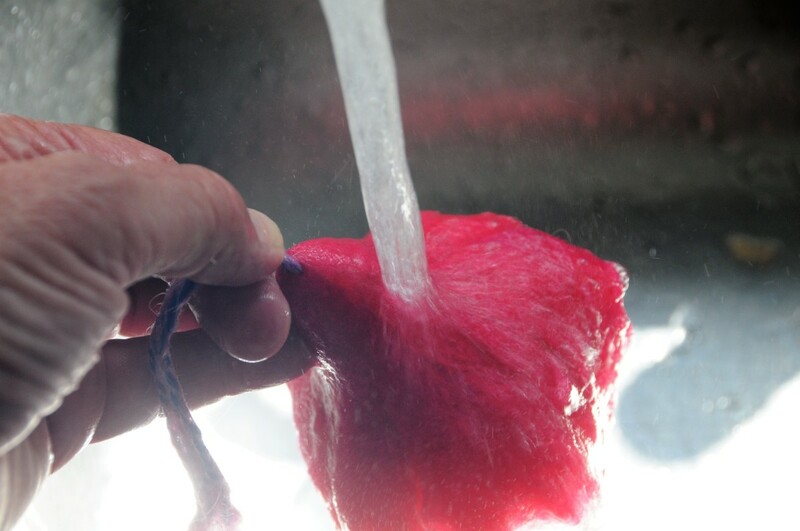 I developed the idea and now realise that the possibilities are endless given my understanding of exactly how the fibres behave under my fingers. 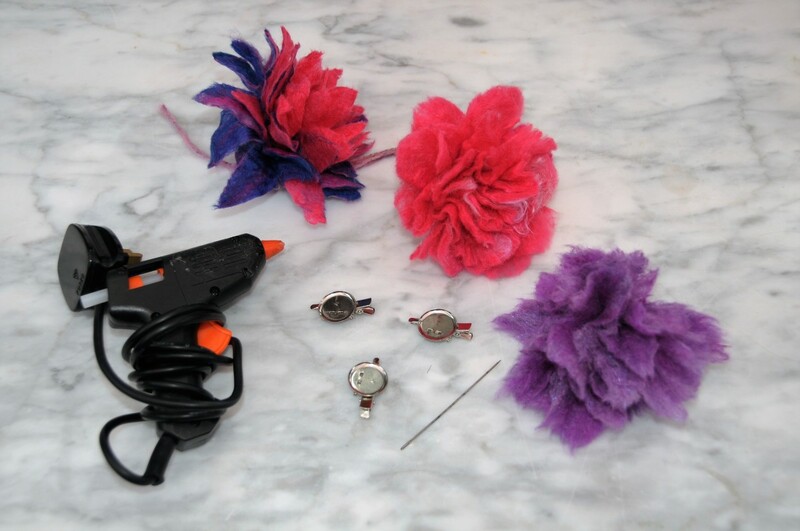 I am already anticipating the outcome of my next project. This is a very interesting technique, Sally. 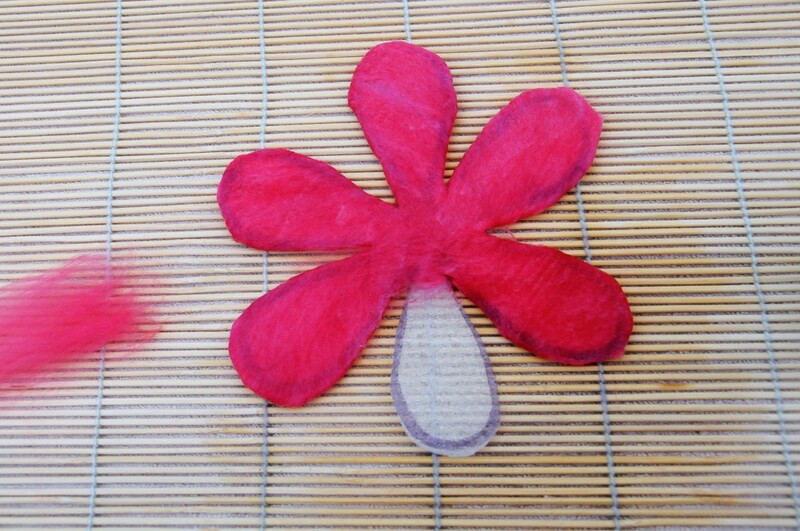 It's amazing to see how different the finished flowers look using different templates. Thanks for sharing this great tutorial!